Artisanship and agriculture have always gone together. Today, we use more economically-laden terms like “value-added” to explain the same concept, but essentially farmers have always made specialty products as a lucrative sideline to their main agricultural business. And if those sidelines are successful and popular enough, they can become the business. Such is the case at Noble Meadows Farm, whose award winning goat-cheese lines have taken on a life their own over the past eight years. Owners Harvey and Carolyn Van Driesten first came into goat milking business by happenstance. The Van Driestens at first sold only the raw goat milk to one local buyer, but soon realized the greater profit to be made was on the value-added processing side of things. 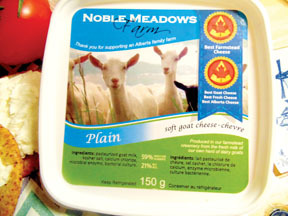 In 2014 Noble Meadow Farms won Best Farmstead Cheese in Canada during the Canadian Cheese Awards, and were finalists in three other categories. This was a significant moment for the family, which helped crystallize their vision for the future of their business. The Van Driestens have since secured wholesale deals, and have entered the retail sector forcefully in Calgary, supplying their cheeses to Calgary Co-op stores. Carolyn, who is the cheesemaker of the business, still does much of the production work by hand. Harvey tends to the goats and the milking side of the operation. With more demand for their products growing, Carolyn says she and Harvey have been discussing the potential for increased automation in their dairy operations. The most popular product Noble Meadows Farm sells in undoubtedly their soft cheeses. The sell five lines of them: Plain, Herbs and Onion, Tomato and Garlic, Apricot Chili and Cranberry Spice. Carolyn says the increasing demand for goat cheese and milk is being driven by consumers in large urban centres across Canada, but those buying the products are not exactly who you would expect. With this booming urban demand, says Carolyn, there are also expectations: Customers want very natural products, ethically raised and produced, and sourced as locally as possible. Noble Meadows Farms checks all these boxes. But outside of these considerations, Noble Meadow Farms also has an allure of something else truly special in their story: Farm-based, hand-made, artisan-style goat cheese, and other milk products, produced with love by the Van Driesten family of Nobleford, Alberta. Photos courtesy Noble Meadows Farm. 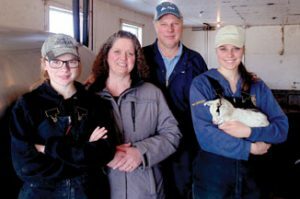 The Van Driesten Family, owners of Noble Meadows Farm. The soft goat cheese which is Noble Meadows Farm’s best seller. Carolyn Van Driesten stirs up another batch of cheese at Noble Meadows Farm.